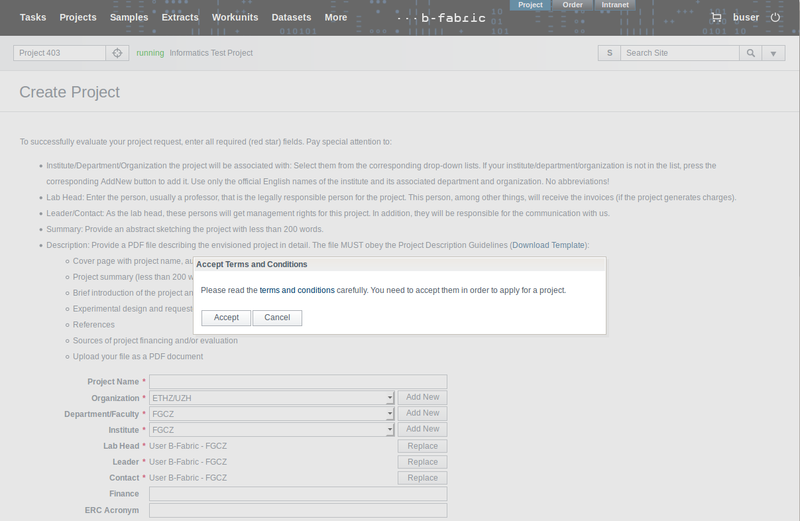 Go to the Request Project form: To request a project you have to be logged in to B-Fabric. Click the "Request Project" link under the item "Projects" in the lower navigation menu on the header. Accept the User Lab Project Guidelines: Next you have to carefully read and accept the User Lab Project Guidelines. Project Name: Choose an appropriate name that well describes the direction of the intended project. Ideally, the name is short and less than 256 characters. Organization: Carefully check the drow-down-list, whether the organization the project or user shall be associated with is already there. If yes, choose it. Otherwise, add the official english name of the corresponding organization. Please do not use abbreviations. Department: Carefully check the drow-down-list, whether the department the project or user shall be associated with is already there. If yes, choose it. Otherwise, add the official english name of the corresponding department. Please do not use abbreviations. Faculty/Institute: Carefully check the drow-down-list, whether the institute the project or user shall be associated with is already there. If yes, choose it. Otherwise, add the official english name of the corresponding institute. Please do not use abbreviations. Lab Head: Select the head of lab, usually the professor, who is responsible for the research activities. Leader: Select the designated project leader. This is the scientist who takes care about running the project and carries out most of the experiments. Contact: Select the designated project contact person (for communication with FGCZ). Usually it is the same person as the project leader, but it can also be another person. Technologies: Choose the technology that will be needed in this project. 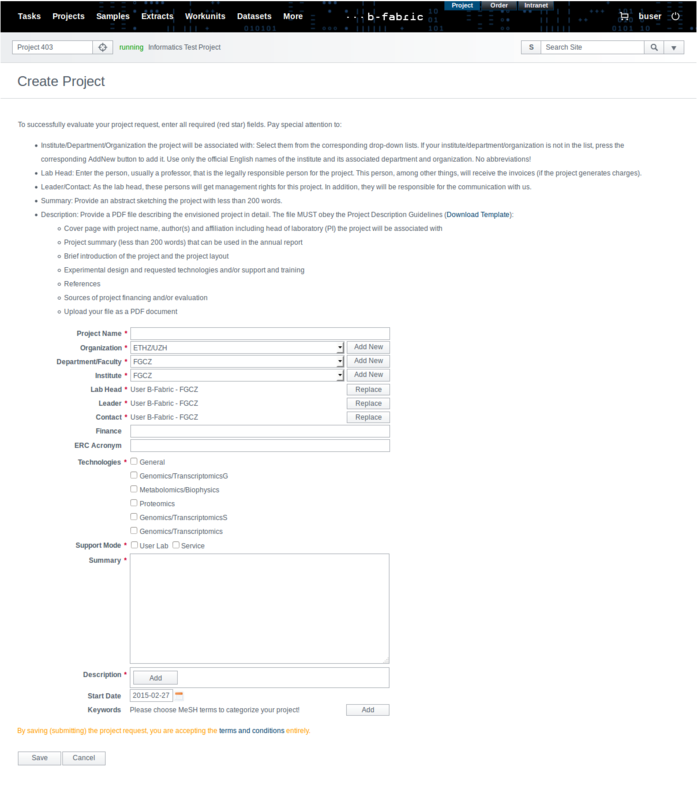 Support Mode: Indicate the type of FGCZ support you need for the project: userlab (mostly for applicant from ETHZ/UZH where at least one scientist of applicants group is involved in the userlab) or a service project. Summary: The summary is an abstract of the project with less than 200 words. It will also appear in the yearly FGCZ report. Description: Provide a detailed description of the intended project in PDF format prepared according to the FGCZ Project Description Guidelines. For the preparation of the project description you may use the project description template (Download). Keywords: Categorize the project by providing MeSH (Medical Subject Heading) terms. MeSH is the U.S. National Library of Medicine's controlled vocabulary used for indexing articles for MEDLINE/PubMed. MeSH terminology provides a consistent way to retrieve information that may use different terminology for the same concepts. Save the form: Once you have entered all the required information, click the Save button. You will receive a confirmation mail and someone from FGCZ will contact you for the further steps. Created by martilu. Last Modification: Friday February 27, 2015 18:21:45 CET by uguerel.